With the recent Virginia shooting false flag incident now blown wide open it occurred to me recently that humanity is in the middle of an era of all-time highest abundance of knowledge and information. We are swimming in knowledge thanks to the internet and technology. This knowledge is easily available to almost anyone in a moderately developed country. Even children have access to this abundance of knowledge. Used properly, the technology and information available to us today gives humanity the tools it needs to overcome and even replace the dying new world order empire seeking control of it. That's the good side of today's technology, knowledge-sharing and information available to humanity. Here's the dark side of the story however. With much knowledge comes much responsibility and intellectual expectation from the species. Given how much knowledge there is available to humanity, we must face objectively what is transpiring before our very eyes. A large percentage of humans are still blinded by the controllers because they are deliberately resisting this otherwise easily available knowledge and this almost unique first-of-its-kind level of resistance seems to be at an all-time high. I say "resistance" because more than ever before in the history of mankind humans can rapidly educate themselves about almost anything. Anyone can easily get past the information bottleneck of mainstream media and do their research and discover how real the globalist new world order plans are. After all, they are not even hiding their intentions. Ask yourself why would they publish the Project for a new American Century BEFORE 9/11 telling the world what their intentions would be? How is it that we have access to 'Operation Northwood' documents clearly outlining the controller's plans for staging false flag terror attacks throughout the U.S. to use as a pretext for war, yet people still think this is not possible? They've admitted Vietnam was a war based on a lie but does anyone care? Crisis actors are now regularly being used to stage sloppy staged shootings but many refuse to look into this too deep for fear of what this new knowledge will require of them. Thus today it requires more mental energy to fend off the knowledge that is easily available at everyone's fingertips. People are apparently willing to put lots of energy into resisting this knowledge just to preserve their paradigms. Consider that today's generation has easier access to concrete proof of false flags faster and more accurately than at any point in history. Much of this information can be obtained in almost real-time. Today, unlike any point in history, people who are privileged to this surreal flow of amazing information simply ignore the information like its not there. This unique engineered modern day complacency and resistance to easily available knowledge I believe is very special and must be pointed out to understand where we are and what possible solutions will work best. Think about that next time you hear people still clinging on to government engineered "official story" lies, false flag events, planned agendas and propaganda. One of the reasons people cling to government lies and resist easily available truth and knowledge is because people don't want to believe things are that bad. They would rather believe that government is looking out for the greater good of the people. They don't want to believe anything that will compromise their view of the world and their paradigm about life. Paradigms are very real and many refuse to change how they think to accommodate a new paradigm. They will ignore logic, avoid tough questions, even ridicule the messenger to protect their belief systems and all of these examples are forms of resistance to knowledge. Cognitive dissonance is at an all-time high. More than ever, people prefer to keep the conversation light. They just don't want to discuss "conspiracies" or government corruption for fear of getting into an unwanted debate. So in order to avoid a debate or conflict over a political issue it's better to avoid the topic. Today many work places expect their employees to avoid discussions about controversial topics because it's not good for the work place. This is an institutionalized resistance to knowledge and it's all deliberate and engineered. This resistance is cognitive dissonance at a mass scale. So, although many people are waking up to the nature and true meaning of current and political events both domestically and globally, there is a great sifting going on and more than ever people are resisting simple truth that would have easily persuaded and awakened the average person many centuries ago if they had the same available information in their time. Thus, I believe this is widening the knowledge gap within the species and this knowledge gap widening is part of an intellectual and consciousness extinction phenomenon that I believe is happening. Sadly, many humans are deeply mentally tangled in the matrix of lies and will likely die in the matrix never having understood how or why they died. Like sheep led to the slaughter. You may wonder, how did we get here? Perhaps due to several factors including that today, propaganda is much more sophisticated and thus more effective. We have sophisticated sensationalized mass media, advertisements, billboards, radio, TV, Hollywood movies, video games, news papers, magazines, social media, cell phone apps and more. All of these sources of information are well equipped to manipulate the human mind especially knowing that today people are subjected to these devices and distractions every day. You may be thinking, what can we do about this mass resistance to knowledge seen today. For one, keep the information awareness circulating. Don't get too worked up every time they execute another false flag. Instead see the false flag from the point of view of the usual script blueprint they implement almost every time and do your best to share the information with those who are still living in the matrix of lies. Then move on and continue focusing on viable solutions for the problems we face. Still running into people clinging on to government "official stories" on one false flag event after another? Realize who you are. Remind yourself that truth exists on its own and it's not up to you to convince anyone, just show them the truth and let them recognize it for themselves. 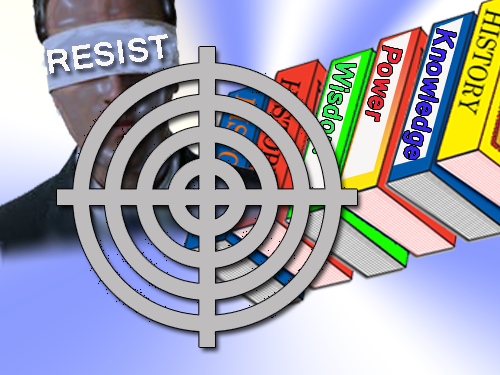 Realize we are living in an era of unusual resistance to knowledge because this resistance is engineered. Realize that it's not about you winning an argument or convincing others of your personal point of view. It's about putting out the objective truth and hoping people see the bigger picture for their own survival benefit. You can lead a horse to water but you cannot make it drink. I believe understanding this engineered resistance to common knowledge we see today is a big part of the puzzle in terms of staying mentally healthy and staying focused on solutions. It's all about keeping things in the right perspective and maintaining your own personal mental, emotional, spiritual and physiological balance. Realize that for as much as people resist knowledge and information freely and widely available to humanity today, there is a constant hope and positive outlook that is burning in our hearts that reminds us that we may be part of an inevitable and important mass human awakening phenomenon. Also lets consider that this knowledge resistance is equivalent to the diver who is too afraid to jump from the high diving board for fear of what will happen if he does. All those people who are afraid of giving up their current paradigms wouldn't be if they were assured that everything was going to be all right. Finally, realize that as things get worse many more people will be inclined to want to change their paradigms for a better one. That is why we need to offer hope to others. It's not enough to point out false flags and focus on the fear and government corruption. We must answer back with some kind of solution and hopeful strategizing. Deliberate knowledge resistance is best met with the fewest amounts of words. Show someone the truth don't debate with them so much. Allow them to believe whatever they want and move on after telling them what they need to hear. It's not about convincing these people or winning an argument, it's about being mentally stronger, more assured and wiser as you expose the other person to objective truth. It's about staying focused on the bigger picture not about burning energy to fix someone else's resistance to truth.